Stand Up for Heroes, the Bob Woodruff Foundation's (BWF) annual benefit event and the kickoff for the New York Comedy Festival, on Nov. 8, 2012, brought together celebrities, service members and their families for a night of laughter and performances from A-list musicians and comedians, as well as wounded veterans, to raise funds for programs that the Bob Woodruff Foundation helps support. The proceeds from the sixth annual event, more than $3 million—bringing to $13 million the total funds raised for all Stand Up for Heroes benefits—will benefit organizations across the country vetted by the Bob Woodruff Foundation for their effectiveness and success. In addition, BWF is now joining the GivingTuesday initiative in order to continue the momentum from the amazingly successful Stand Up for Heroes benefit, which will allow the foundation to fundraise via micro-donations and activating its social media constituency. 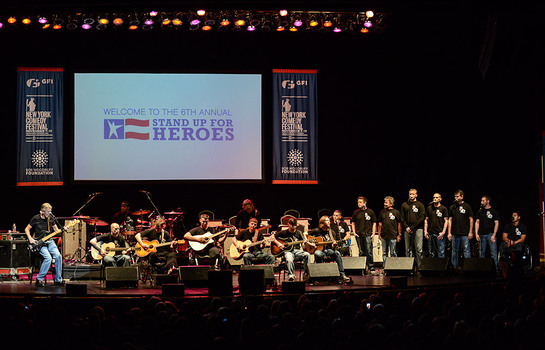 For the first time ever this year, the Stand Up for Heroes event was live streamed on YouTube—with performances by Bruce Springsteen (who was joined by his wife, Pattie Scialfa, for one song); John Mayer, who performed an instrumental version of the Beatles’ “Long and Winding Road” on an electric guitar; Roger Waters, who took to the stage with a band of service members. Specifically for this event, Waters enlisted warriors from an organization the Bob Woodruff Foundation funds, the rehabilitation program MusiCorps—along with help from MusiCorps’ founder Arthur Bloom. MusiCorps operates out of Walter Reed National Military Medical Center. Comedians who took the stage for this year’s 6th annual Stand Up for Heroes event included Mike Birbiglia, Ricky Gervais, Patton Oswalt, Jon Stewart and Robin Williams. The musical acts, as well as performances by the service members and interviews with celebrities in attendance, are still viewable on Remind.org. Donations can be made on the site, as well, at Remind.org, or by texting “BWF” to 50555 to donate $10. Follow the Bob Woodruff Foundation on Twitter @ReMIND and take action by participating in the #GivingTuesday movement this season on Nov. 27, 2012. #GivingTuesday is a movement to celebrate and provide incentives to give, culminating with a national day of giving on Nov. 27, 2012. The effort harnesses the American spirit and collective power of a unique blend of partners—charities, families, businesses and individuals—to transform how people think about, talk about and participate in the giving season.#GivingTuesday will leverage the power of social media to create a better world. In addition to the Bob Woodruff Foundation, founding partners include Blackbaud, the Case Foundation, charity:water, Darden Restaurant Group, DonorsChoose.org, Global Giving, Groupon, Kiva, Mashable, Unilever, United Nations Foundation, United Way and VentureThree Capital.